My grandmother was unlettered and was treated as such by the community by and large. Her knowledge was not valued as it was non-Western and called “broken.” She called herself a speaker of “broken English” and her son, my father, spoke of her Bhojpuri language as “broken Hindi.” The truth of the matter is that she was not broken at all. Her Creole and Guyanese Bhojpuri was capable of vast and epic narratives, illegible to those who dreamt in English. One of my favorite memories was visiting her home in Toronto and listening to her sing her songs. She sang of an evil queen who banished a noble prince, other stories from the Ramayana, the shifting familial ties in diaspora — specifically the ways brothers and sisters did not get to see each other sometimes for entire lifetimes — and of course bhajans. These were left aside for books in English. My father felt compelled to convert to Christianity, to let go of his rich cultural inheritance because it was socially disadvantageous — he thought to himself, Illiterate Coolie nonsense. This survival strategy for a postcolonial brown Guyanese person afforded his leaving Guyana to study in London, England, the proud beating heart of Empire. Thankfully, my grandmother's language and poetry wouldn’t be dead for long. One particular song that became a kind of family anthem was “Kaise Bani.” We sang and danced in our aging Aji's one bedroom Scarborough, Ontario tenement, my brother, sister, and I. My grandmother would beat a pot or a mixing bowl and we would laugh and dance until we were thoroughly winded. She then would play the rest of the Sundar Popo LP that she had and we listened, bewitched by his Creole-meets-Hindi tunes. What I suspect about Sundar Popo, and the reason he is so influential in my own poetry, is that he wrote in and out of three languages: Trinidadian Creole/Patois, Trinidadian Hindi, and Standard English. To me this blended all of my home spaces: my grandmother’s Guyanese Hindi and Creole and the Standard English that flowed everywhere else that tried to erase what came before it. I felt as though I stood on a meeting place of languages, much as my grandmother did. Her parents never spoke English and now her children only speak English. This poetic was almost lost to me in my generation. With hard work and dedication, I became a devotee of my family languages — something that I felt tasked to do. In doing so I realized a vast poetics at play in my grandmother’s songs and stories. I used his song as a poetic guideline in creating my own form of poem. “Chutney poems” speak to my sense of a poetry descended from the Indian Labor Diasporic poetics, drawing from my formal education in the United States. I call this a “chutney poem” because it mimics “chutney music,” a genre of Indo-Caribbean folksong developed by Sundar Popo. It has a Guyanese Hindi chorus that informs the following couplets and draws from my three languages: Guyanese Hindi/Bhojpuri, Creole, and English. To this music/poetic, themes of loss, love, and separation are vital. The chutney poem is my resistance to monolingualism and social, ethnic, and linguistic erasure. 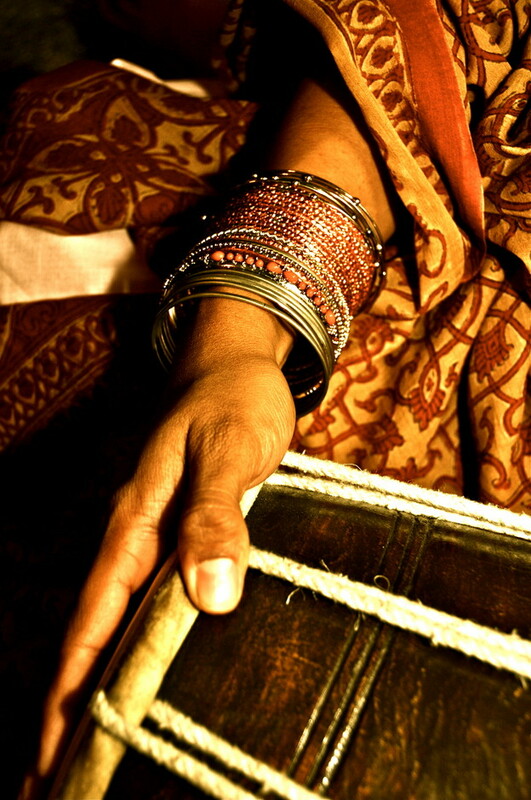 I imagine the dholak, harmonium, and my Aji singing from India to Guyana to Toronto to New York to Orlando. I purposely queer the sonnet as a slyly civil anticolonial measure to make it as queer as an Indian in South America; a sari in sea-trunk. The first couplet in Guyanese Hindi reflects and informs the theme of the poem, yet is distant enough to be complete on its own. I use parataxis as a metaphor for Diaspora to show the distance and proximity of three distinct worldviews and to highlight the survival of subconscious (linguistic/mythic) history as it affects the conscious mind. Find a folksong that you have a deep connection with. One that you grew up singing and dancing to, a folksong that your entire family knows. It doesn’t have to be in a different language. Maybe it’s a murder ballad, maybe it’s a religious song — all that matters is that it’s meaningful and that the song holds your personal and cultural histories. Now break the song’s lyrics down into lineation, noting how many words and syllables are on each line. Now consider which of the folksong’s poetic conventions you will keep. Will you keep the same rhyme scheme? Will you keep the same thematic thrusts? When creating your form based on a folksong, are there any specific English language forms that you want to reference? Perhaps your version of the folksong poem has fourteen lines and echoes the sonnet. Maybe the return and repetition is inescapable in that it has a direct relationship with the villanelle. Whatever the case may be, this is one way to add another layer to the poetic constraints that you’re thinking up. Your poem must connect between three to four different countries. You must include layers that show your various dialects in conversation with one another. It would be most helpful if there is a cultural capital imbalance, meaning there is one language that is socially privileged over the other “non-standard” dialect. Your poetic form must bear the weight of a postcolonial history, showing what language attrition looks like in poetry.